The first 6 months of our season was a pretty intense affair. We boarded the train to bouting oblivion in February and didn’t get off until late June. We skated in 4 countries – Wales, Scotland, Belgium and France. We didn’t even play a game in England. 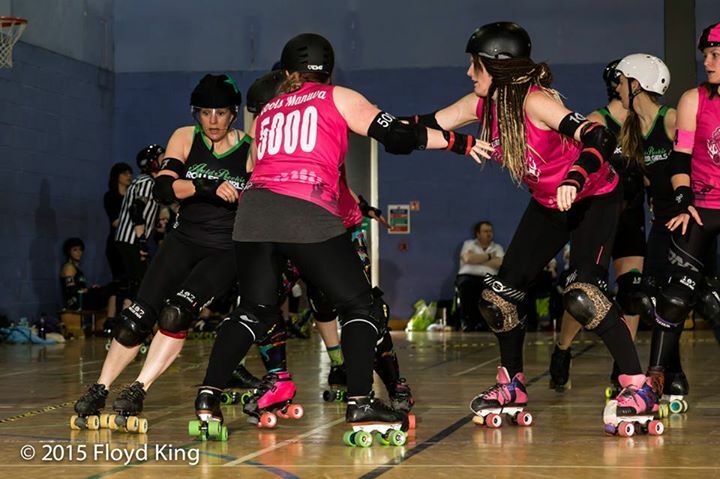 It was travel and tournament heavy – we certainly locked down the ‘how to feed and look after ourselves whilst at all day roller derby events’ business. We knew that skating premier tier of the British Champs was going to be difficult. We went into it knowing that we’d face some of the strongest teams in the UK and some of the most challenging games we’ve ever played. We certainly weren’t let down. Our first weekend saw us journey to Cardiff to play Tiger Bay and Glasgow – 2 strong teams with very different styles of play. We lost both but were proud of how we played. We saw that there were areas for development in our game and aligned our focus to prepare for the upcoming high level competition. We went to Edinburgh for weekend 2 to meet Middlesborough Milk Rollers. Always a challenging team, MMR took the win, but we felt assured that we were starting to see some of our practiced defence on track. For the final weekend we ventured to Glasgow to challenge Rainy City and Auld Reekie. We took a narrow win against Rainy (our first win since May 2014) and a narrow loss to ARRG. The games were real nail bitters – in fact, the whole weekend was full of nail bitters! We put out strong performances against 2 teams we really admire that weekend and it was impressive to see the team put into action all of strategy we’d been working on. Despite knowing that we are likely to drop down a tier next year, we came away from the tournament inspired and energised. SKOD was another big highlight. We travelled to Belgium with a small crew and fought hard in each game. 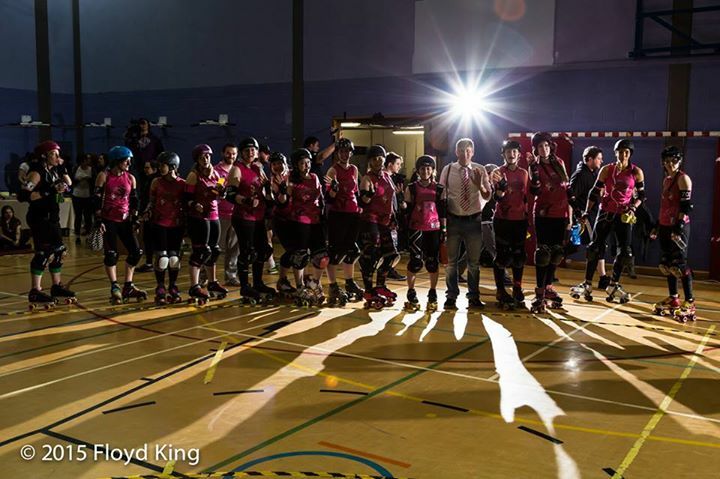 We faced Paris, Gent and Dirty River Roller Grrls. All 3 games were challenging for different reasons. Paris were agile and elusive. Squad changes meant that there were several skaters we were unfamiliar with and so we went into the game not knowing what to expect. The game was tight but we managed to hold on to a narrow lead to take the win and a place in the semi finals. In the semis we met Gent – a position we’d been in almost exactly a year ago (Gent beat us in the semis of SKOD 2014). We knew our opposition well, their squad having remained largely unchanged from 2014. We started off strongly taking a significant lead in the first 20 minutes. But Gent fought back hard and closed down our lead. They ultimately took the win and their ticket to the final. We went on to play Dirty River in the 3rd / 4th place playoff, finishing the tournament in 3rd place and earning ourselves a medal. We have some exciting events on the horizon as we venture into the second half of our season. 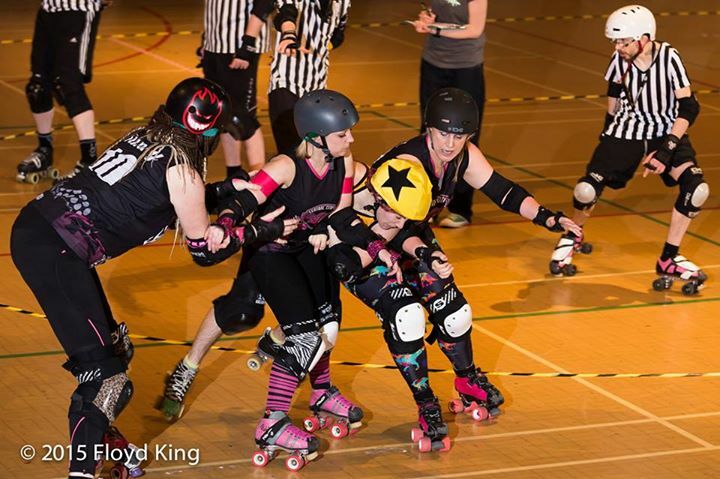 Firstly our game against Hell Fire Harlots in September, followed by a game against Newcastle in October. I’m also very excited about the bootcamp we’ll be hosting in September. It’s the first we’ve hosted with our own coaches and we’ve enjoyed the challenge of planning the sessions. Click here to check it out!